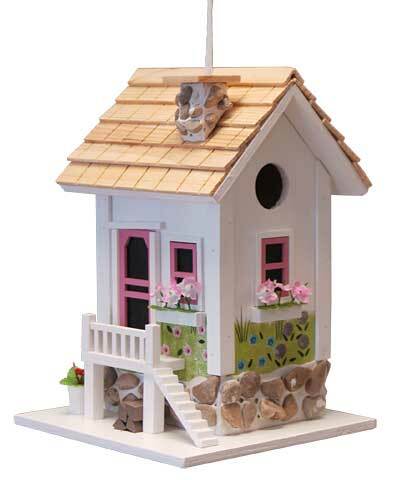 Add springtime color and whimsical style to your backyard with this Home Bazaar May Cottage Bird House. Placing this vivid bird house in your garden can help your favorite songbirds thrive, while enhancing the setting with a wonderful, floral motif. The white body of this charming unit perfectly accents your garden setting, and a faux door and windows with pink trim add a realistic hint to the piece. White window boxes and pink, fabric flowers mesh with the trim for a fantastic roost. A 1.25" diameter opening on the side of the unit allows small songbirds to enter the home, and its deep body protects nestlings from predators. The pitched wooden roof lends classic shape to the piece, while its overhang helps direct rain away from the nest. Drainage holes on the base keep the nest dry, and a small door on the back of the shelter swings upward for quick cleaning. The attached, fabric hanger allows you to display this home on a hook, while its flat base can easily accommodate a mounting bracket (not included) for placing on a pole. The wooden construction helps the birds remain dry and warm, while the painted finish and bright flowers enhance your home or yard. Add a floral and fun roosting spot to your bird sanctuary with this May Cottage Bird House.